Although the official Laminar Research X-Plane11 release before Easter was done and completed. I wasn't that endeared to it, as It felt slightly rushed and still of wanting of a few more bugs that needed to be addressed. It ran and ran well, but not to the level you expect from an official release. History has primed me now for these software pre-releases. Back in the day no business would fear to release none or incompleted product. But in the age of the instant download it is then if you screw up then a patch or redownload quickly fixes the issues. Apple was the worse at this and to a point uses its own customers as benign beta testers. But today the sheer complexity of software means that not all the issues are fixed and the details can be lost on release, but in this case the X-Plane11 release was done with a to-do list still on the whiteboard and so is that fair to its customers? In this case the release time-line came first and the product came second. But this is common software and to a point even a hardware standard business practice today. The wait for the first update was a while as well as everyone enjoyed the Easter Break, but the long wait overall was worth it as X-Plane11beta1 was a what the release version should have been in the first place, the release XP11.01rc1 - release candidate 1 was even better and you have to admit the simulator is now beginning to show the brilliance of what X-Plane11 is all about. My only current gripe is the on the thrust reversing action on jet aircraft. On prop aicraft there is a beta zone behind the throttle idle position that turns the propeller thrust in the opposite direction by twisting the propellers into the opposite position... I'm fine with that. But in Jet aircraft there is no beta zone and you activate reverse thrust via a set of levers (for the number of engines you have). In X-Plane10 you used the key command "toggle thrust reversers" to do this lever action and used the throttles normally. But with the XP11 beta zone in that area you get a really confused jet engine and a zone between the forward and reverse thrust segments that is almost impossible to find? Worse in that my new (and excellent Saitek x56 joystick system) is very sensitive with duel throttles in these zones. So even in the final landing phase you are mostly likely in trying find your idle in that barely a few feel above the runway... go totally into reverse, or on the runway go totally into forward thrust. It is not a fun ride either way. You can of course fly around the problem, but that is not the point as it needs to be addressed and quickly. But back to the brilliance. Without doubt two new features in X-Plane11 have changed the game for Laminar Research. One is the new interface which is the more you use it, then the more you absolutely love it. It still needs a few more areas of attention, but the sheer flexibility on accessing not only setting up the simulator but in changing your settings to a new situation (say helicopter collective) is just brilliant. Go back to X-Plane10's menu system and I guarantee you will be frustrated within minutes on how long and how complex it is just to set up something simple, because it is all that waiting and going though all the long winded motions to get there that will drive you bonkers... it is certainly relief to get back to the XP11's interface system and get on with your flying. Second new X-Plane11 feature was PBR (Physical Based Rendering) and yes I have mentioned this effect before, probably countless times. But you must be made aware of how important this feature is to X-Plane. HDR (High-dynamic-range rendering) was of course a step in the right direction, but it is in the minute detail of PBR that is transforming our simulator. In fact over time it will be the PBR factor that will be the biggest attraction to new users wanting the sheer realism it delivers. PBR still totally blows me away on the detail it can visually create. It gets better. As noted by Laminar Research's developer notes there is more fine tuning to come. One area has already had attention in that of night reflections in "Let's get physical at night". In the past night flying was quite average and boring, and yet it should be one of the most exciting times to fly aircraft. But the look of the night in X-Plane visually was quite average. First the actual night sky has had a (finally) makeover and the new moon is simply excellent. However the blinking on and off traffic flows below still needs some attention, but with the new PBR fine tuning as noted in the developers blog, your aircraft now looks excellent flying in the dark inside and out. Come early dawn and dusk and the realism is spellbinding and this makes the simulator far more perfect than ever before, you actually now look forward to flying in the dark and not try to avoid it. Mostly the main areas of X-Plane11 are now set, but the fine-tuning will continue for quite some time yet, so that means there is still more to come, certainly not in the huge jumps of the past, but in small incremental changes that will bring the simulator to a whole. April was dominated by re-releases of aircraft for X-Plane11 so your inventory or hangars were slowly filling up. It was wonderful to experience many old favourites again in their new shiny X-Plane11 clothes and their new misty environment. But it is hard work to note what is updated and what is not as many developers just revised and delivered the new version. But overall it is an exciting time. Of top notch developers then this year then Aerobask certainly have produced two amazing aircraft. The Pipistrel Panthera v3 put X-Plane another level higher in features, but they followed that experience with the Eclipse 550NG only a few weeks later... both are well worth flying and experiencing, but again the main point is that X-Plane has some of the best developers in simulation, we should all be proud of their work. which was a great follow up from Washington XP by Drzewiecki Design in march. So you finally get the feeling that X-Plane is filling in all the scenery gaps that have been another area that X-Plane was criticised for in the past. But I personally don't see with a current trend on creating new scenery when you have an already good one and payware or freeware at that already available, we already had a NAS KMCO (although the Nimbus one is far better) and another scenery released in KDFW by Aerosoft when we have a Tom Curtis KDFW version? There is another KORD coming as well? Why replace or compete with established scenery? I am all for making scenery better, but overall I think resources are better spent somewhere else that is required.... hello a HECA Cairo would be a really nice addition and don't get me started on Asian airports like WSSS (Changi) and VHHH (Chep-Lok, Hong Kong). But one that did really did surprise me was JustSim's amazing ELLX - Luxembourg. I was only going to do quick overview review and that quickly turned into a full review of this excellent piece of work. Every few months JustSim churn them out and they are all simply top-notch sceneries and for prices you can afford. I was sad to move on from ELLX for another review, but it was a great experience while reviewing it, but I will be back soon as I can. What differentiates JustSim and the really good scenery developers is the full use of X-Plane's and certainly X-Plane11's great features in scenery. You now EXPECT such detail and effects as per normal in all scenery that is payware, but when it is not done you do feel a little shortchanged, the level of quality has gone up, and in a big way. But metalness, glass effects and shiny runways are great visually and add a huge amount to the realism. If you are not using these tools then you should be as the advantages to your work and return sales are worth the extra effort. JustSim are the current masters, so developers learn and take notes. 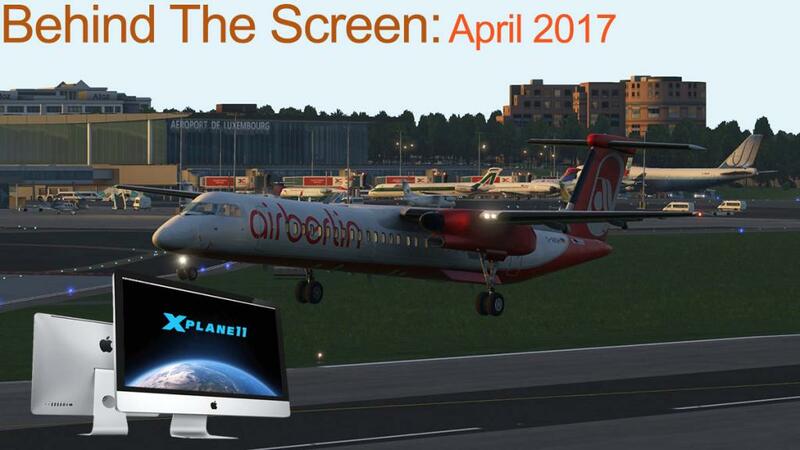 So like every other month in Trump's first 100 days in office, April was a full and varied cosmopolitan month in X-Plane. I doubt the rush will abate anytime soon, but it is a very exciting time to be in the X-Plane simulator world.